Yes we do weddings! You deserve a fabulous wedding...we specialize in fabulous! Call now for a free consultation, and free quote. This beautiful bridal bouquet,has a vintage look, with strings of pearls, and twigs sprayed with a fine mist of glitter. This soft look is sure to complement any bride on her wedding day! 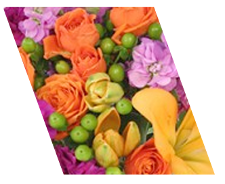 This wild flower bouquet, looks as if you went in to a garden and pick beautiful flowers. The array of colors are just stunning! This stunning bouquet of lilies, blue orchids, and white roses, is sure to be a eye catching moment in pictures! This soft and pretty bouquet, will add a romantic feel to any bride on her wedding day! Many white flowers, that complement each other in one bouquet. This soft looking, succulent bridal bouquet, has a natural look to it. It very pleasing to the eye! This beautiful array of colors, is so bright cheerful, it is sure to put a smile on any brides face on her wedding day! This bold bouquet, makes a statement,and will have eveyone talking.The bold blue orchids cascading down will make a bride stand out on her wedding day! Hot pinks, purples, and yellows, what bright splashes of color for a bride on her wedding day! This funky feather bridal bouquet is sure to stand out on your wedding day! This fall bouquet has a lot of wonderful textures going on, and beatiful colors that are very pleasing to your eye! This lovely jewel toned colored bouquet, will complement any bride on her special day! This is sure to leave a ever lasting impression with a bride on her wedding day! 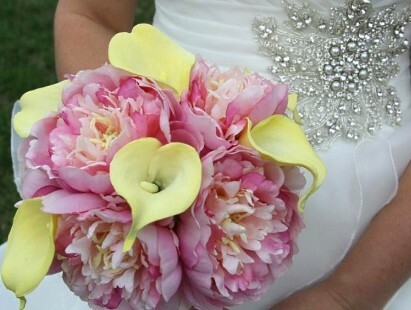 This bridal bouquet can be made very meaninful by putting your own touches into it. Like broches, or what is meaninful to you! This bridal bouquet has a nice pop of color, with beautiful white lilies. This soft pink garden rose bouquet,will bring a very elegant look to a bride on her special day! This vintage purple bridal bouquet will compliment any bride on her wedding day! CREATIVE CHICK FLORAL AND GIFTS takes pride in always delivering professional service and the highest quality flowers and floral presentations around! When planning your wedding, we take special care to ensure the bouquets and floral decor reflect your individual style and budget… whether you prefer a look that is timeless and traditional or sleek and contemporary. Whether formal or casual… a small gathering or the social event of the year… it's sure to be a “blooming success” with flowers from CREATIVE CHICK FLORAL AND GIFTS. Call 605-362-5869 to schedule a consultation and let one of our expert floral designers help you plan an unforgettable event!